The work of dozens of Syracuse University employees was recently on display inside the Noble Room at Hendricks Chapel, as part of the On My Own Time exhibition. From paintings to sculptures to photographs, the artwork is a demonstration of the hard work and creativity of Syracuse University faculty and staff. While all of the artwork on display is noteworthy, a panel of judges found nine of the pieces award-worthy. 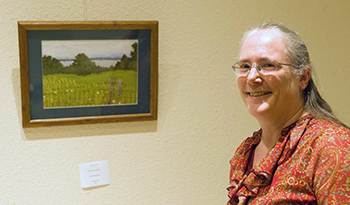 The Most Popular Piece as voted by Noble Room visitors went to Roxanna Carpenter for her work titled “Lake Champlain“. 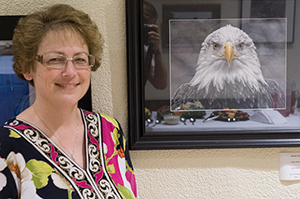 University Libraries Executive Assistant Kelley Parker’s stunning photograph of a bald eagle was an award winner. “On My Own Time” is a creation of CNY Arts (formerly the Cultural Resources Council of Syracuse) and Onondaga County, in cooperation with the Everson Museum of Art. It was developed as a community arts program to bring visibility to the creative skills of people employed in local businesses.